Our decorative iron chandelier is suitable for medieval, renaissance or colonial decor!. 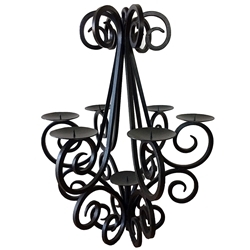 This fully functional iron chandelier holds 7 large or small candles and can be hung by a ceiling chain (not included). Please note: Each is handmade and all measurements are approximate.